A cozy cottage with spectacular 180 degree view of Lake Ontario, located near Picton and Bloomfield, in the midst of town and wine country. 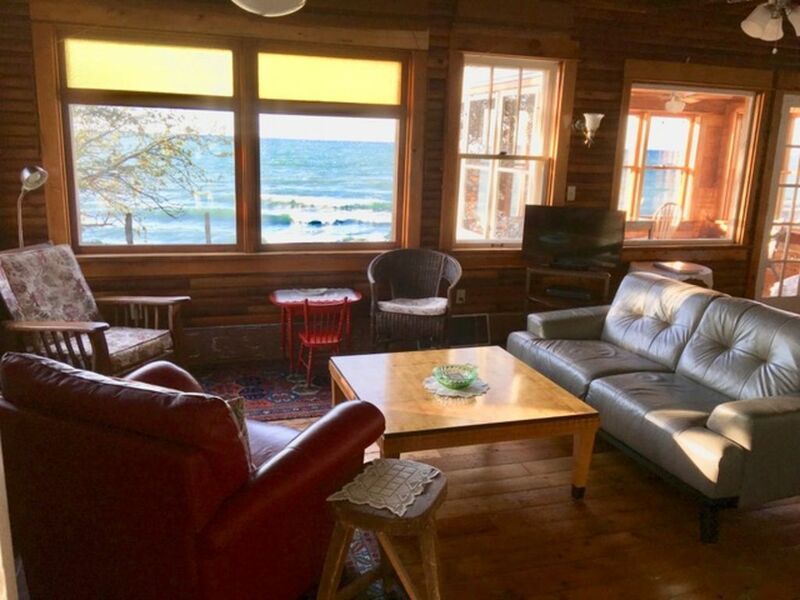 This water side house was inspired by and has been recently restored to the feel of a gracious turn of the century upscale sea side Guest house with extensive use of cedar and vintage wood on the interior. We call it “West Water Place”. It is located conveniently in the beautiful water front vacation town of Wellington Ontario, on a quiet street directly overlooking majestic Lake Ontario. West Water place offers a stunning uninterrupted 180 degree lake view from every room and cool breezes when the summer is hot. It’s just steps from shops, restaurants and ideal for cycling to wineries as well. In addition, this small town meets all your daily shopping requirements, food store, pharmacy, and vegetable market, LCBO, all within easy walking distance from your cozy cottage. Watch the sun rise over the famous Sand Banks Provincial Park while listening to the waves breaking along the gently sloping limestone shore .A perfect place for swimming, directly in front of your house, or body surfing/ wind sailing when the winds are up. Enjoy the long summer night from the sun room or deck admiring the moon’s reflection on the lake, and the melody of the happy sound of the waves. This luxury vacation home offers all modern day conveniences, and has been totally updated in every way. As you enter into West Water Place you are welcomed by a large open concept living room/dining room with original beam ceilings, old pine floors and a comfortable mix of antique furniture. You will be greeted with an unobstructed southern exposure view of the beautiful Lake Ontario from every room. Directly off the dining room is the well laid out kitchen equipped with dish washer, antique pantry/ sink and all cooking utensils ready and waiting for the cooking enthusiast, again with a full view of the Lake. After a busy day on the deck or entertaining friends, satellite TV. and VCR awaits you to relax and catch up on the news or take in a movie. Best for last , completing the main floor is the majestic sun room , with wall to wall traditional windows featuring an amazing view of Lake Ontario, as if you were gazing from a cruise ship onto the ocean. This is the room you will use for breakfast and lunch or to sit in out of the sun or weather, all the while enjoying the breathtaking view, and the sound of the waves. The gracious stair case with antique banister, the kind you used to slide down at grandmothers house, takes you to the second floor where there are two additional large traditional bed rooms each equipped with a queen size bed and a single bed, again with two windows in each room overlooking the lake. The upstairs spacious bath room features a claw foot antique tub with shower and vintage sink. All bed rooms have fine linen and fluffy towels, always fresh and clean. The spacious hallway provides plenty of closet space. The large south facing ground floor level lake view patio deck, directly off the sun room and ground floor bedroom, is complete with BBQ, and wooden Muskoka chairs, and has a large cast table and chairs ideal for outdoor dining , lounging with a book, or just taking the sun. We were at the cottage for a wedding, staying a week. Very rustic cottage with a lot of charm/character. The water view from all the windows is excellent. Busy little side street, but interesting to people watch as you sit in the sunroom or on the deck taking in the water's waves . Well equipped kitchen, facilities. Walk around the corner to shops, grocery store, restaurants, playground. Our favourite shop for fresh veg, baking goods etc was the Red Shed. A charming and comfortable cottage . We loved everything about this cottage, especially the location. Artisanal ice cream and bike rentals just down the street. We appreciated the air conditioning during our week because it was a warm week. Jasna is lovely and very responsive. Bring your own beach towels (bath towels are included). I recommend water shoes because many local beaches are rocky. Of course, nearby Sandbanks is famously sandy. We love WWP - a nice cottage and great place to spend time in the summer! As always, enjoyed our week in Wellington and The County. I spent a week there with 2 friends. Although it looks like a regular house from the outside, the inside is very rustic with exposed beams, original wood flooring and lots of comfortable seating. The house is situated across the road from the water, and you can hear the waves at night - very soothing as you drift off to sleep. Not good for swimming though - my friends drove to Sandbanks to take advantage of the calm and shallow water. It's 2 blocks to the main street with a great selection of restaurants nearby. Our family of four had a great time at this vacation home. The location is perfect for walking to groceries or the park, and a quick drive to wineries or Sandbanks. Beautiful waterfront views from the main floor rooms and deck. Lots of space for everyone and everything we needed to cook our own meals. This home is well cared for, and Jasna the owner was great.